Premier League defending Champions Manchester City have entered the race to sign Wilfried Bony from Swansea City, as per Daily Telegraph. Manchester City boss Manuel Pellegrini has played last three League games without any proper striker as all the first team strikers Sergio Aguero, Stevan Jovetic and Edin Dzeko were out that time. However, Aguero and Dzeko are still out but Joveitc has finally returned and fully fit to play. The big loss is Aguero who was performing exceptionally, he is still the top scorer with 14 goals in the Premier League. With the Citizens are now back on track, they need a striker for the second half of this season in order to continue their challenge for the Premier League title. The Ivory Coast international has been rated around £30million and City boss is eyeing to splash that cash to solve the striking issues. Guardian reported that City are still eyeing him strongly despite the Swans have denied to sell their star striker. Bony has been exceptional since his move to the Welsh side last year. He has scored 33 goals in 69 games in all competitions. 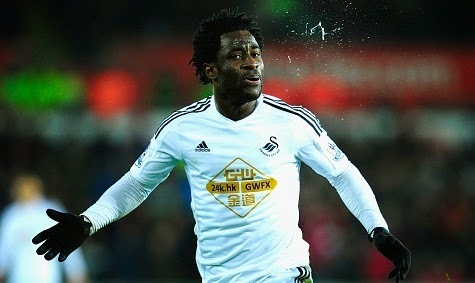 Reports have also linked Bony with Liverpool as they are also suffering in front of goals.